Summer is here !! Ahead 93 days 15 hours of good weather and, many, many options to enjoy this pleasant season. Why not tell me that the summers are a time for fun things to make millions, relaxing, family, interesting, training, … And how many good memories come to mind us if we begin to remember some summers of our lives! For example, those from our childhood: in my case, very long evenings playing a thousand different things in the streets of my town, A Fonsagrada, for then was played both on the street… and when we gave the third warning mothers / parents, almost dark, back home, exhausted, satisfied, hungry , full of dirt and even some new wound (normal after dragged or thrown from either side, climbing the odd tree or wall, a fall of bike or skates, .. ). And then came other summers, also great, summers of adolescence and college, where and night out with friends are an important part (here I can not remember my dear friend Carmen… How well we had !! ), dating the first summer with my husband and all who came after, including the travel we did (not great, as follows) and clear, four years, summers with children, happy, only, steadily, enjoy watching them but always in the background and spinning all around them, What I will tell the majority who do not know ? Good, good, good, Many memories …. and many rich fruits the summer also brings! 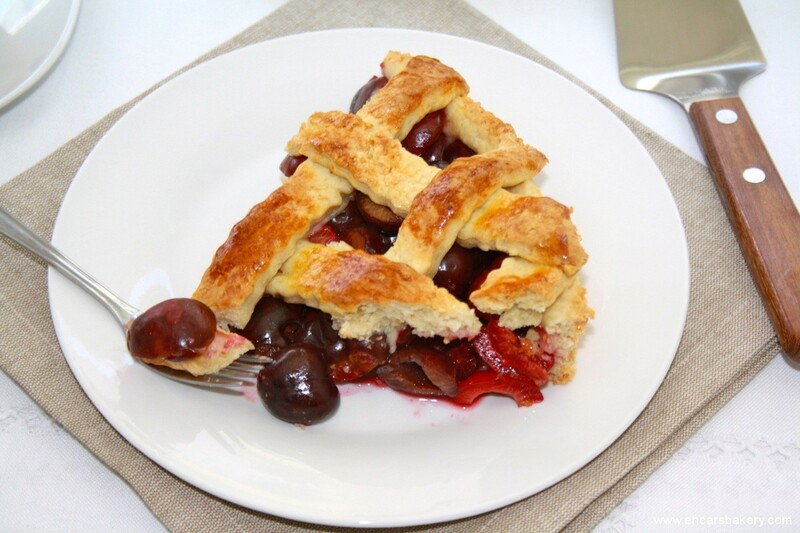 Yes, Cherries are a good example, Cherry Pie's a good way to take them, So here I leave my proposal for which I relied on suggestions from Rico and sugar and Gastronomy&Cia and took what I liked about both, with some modification … The result, Spectacular !!! One day, even from the days before, to make the cake, debone and wash the cherries in half partiéndolas. Mix them with sugar and brandy and let stand, covered, in the refrigerator. We started making the dough. To this mix flour, salt, sugar and yeast. Then we add the butter, at room temperature and water, little by little, and knead until a smooth elastic dough (we will take the amount of water needed to reach this point). Make a ball with the dough, wrap it in a cloth and let rest, at room temperature, one hour. After the rest period, knead slightly to remove air, separate 1/3 part to make the grid and stretch the rest with the help of a roller. We covered the mold with it and prick the base. Prepare the strips to make the grid. 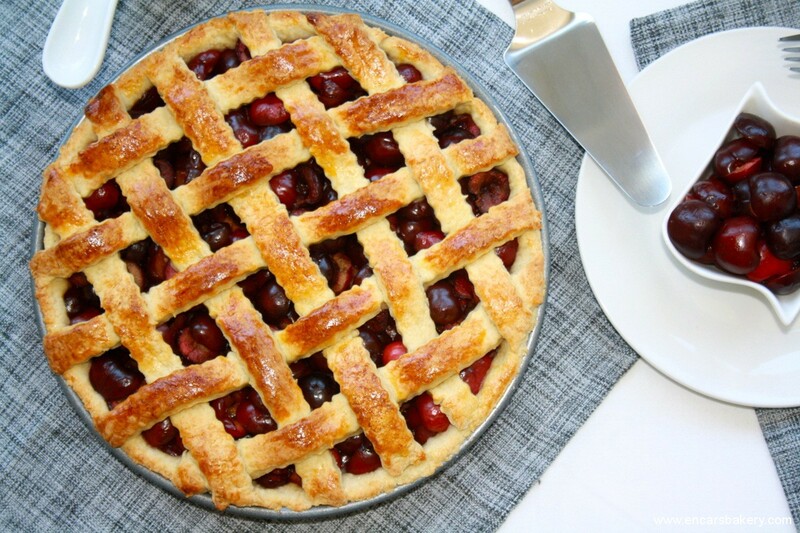 We took the cherry filling and close the pie dough strips interlacing. 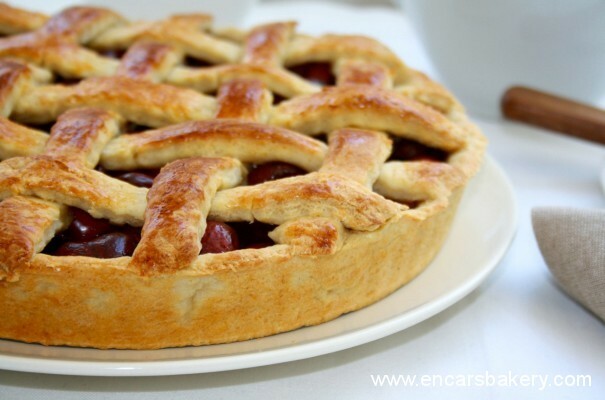 Paint the dough with beaten egg to form the grid and the edges of the cake and bake, in preheated oven at 180 º C, during 25-30 minutes (control the dough is cooked without browning too). Once out, let cool before removing from pan, although this cake can be enjoyed warm tamibién. I hope you enjoyed…. Ah! Although the holidays and do not start, Happy summer! Not the start I still, so see you soon. Ohhhh that most adorable cake, I like! Incarnation has been precious, your hands and that you like! Mother would take me if your blog enterito hehehe, ati and also if you could!! !I love the tartaa is wonderful, I also have been beautiful and I love the photos! !A beautiful big kiss!! Looks good, I have to try to make me crazy cherries! Encar, yes, Summer's already here. I like you I'm in that phase of summer with children and the truth, but exhausting, is wonderful to see how well it passes the dwarf. Of memories, well yes, too many memories that come to mind, I mainly remember the hours and hours lying on the beach. At the end of summer do not see as protruding eyes on those tanned bodies, eggs. The cake seems to me a delight. A I love my cherries, I eat them as pipes, so after being allowed to macerate for two days must be tremendous on the cake. If I say I can not wait, This will copy it on the fly and if I have luck with macerated cherries leave a couple of hours. It has a look so tempting that I start to make progress. Summers are a time when no cole! luckily I carry the small camp in July, or I go crazy. how easy the proposal you give us…especially now that there is little for the cherries to climb in price and we go the opportunity to enjoy this fruit rich in vitamins….the about to….I read it in detail and see that it is super easy to do….but what I can not give me is the interlaced….You should do a tutorial for it…I'd appreciate your admirer….detail that gives a hint as elegant…know ?…you should ensure your hands….does any artist…!!!…. Yes it is easy, Ernesto, Lattice and also! Because I do not need any tutorial… simply, put all the strips that go in one direction and, the remainder, one to one, placing the going in the other at each crossing and passing through a side, one above and one below; start with the next strip backwards.. what you see as what you doing, no mystery. And at the end, you seal the edges, pints … And ready! I dig the cherry, and from then on your cake, must be very rich. The presentation you have been great, and the grid is divine. As always, do an outstanding job. 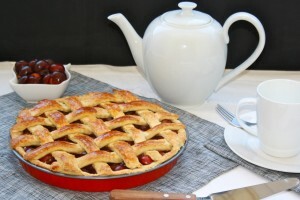 Yes, Summer has begun and I'm going to be aupa… Certainly, I love cakes with cherries and cherry pie is a classic. Me encantaaaaaa!! Cherries are divine and I love, and this cake I've always liked. I have been pretty. I enjoy the summer by the amount of fruit that brings, including cherries. I have no knowledge when it comes to them, especially picks. You say you have to wait two days with macerated cherries? That's a sacrifice. Kisses. I have been pretty, Encar! often so professional network, I have a better pulse!! How well the cherries are juicy and very tasty? The cake you has been precious, I love cherries. 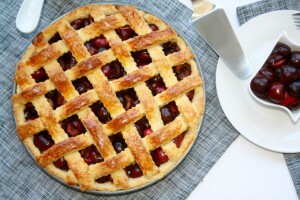 This I have to prove, looks delicious and with those cherries macerated… Enjoy the summer, even if you go on vacation yet. I remain 2 months to enjoy. A kiss. God is beautiful! I have been so typical is perfect, I have never made or tested, but I assure you the copy and I'll tell you, I loved. A perfect cake for these dates, also quite simple but the hardest bone in the cherries and eat them go without! That is good looking and nice you have been the foot. I like the mass used, is very rich. Happy summer!! 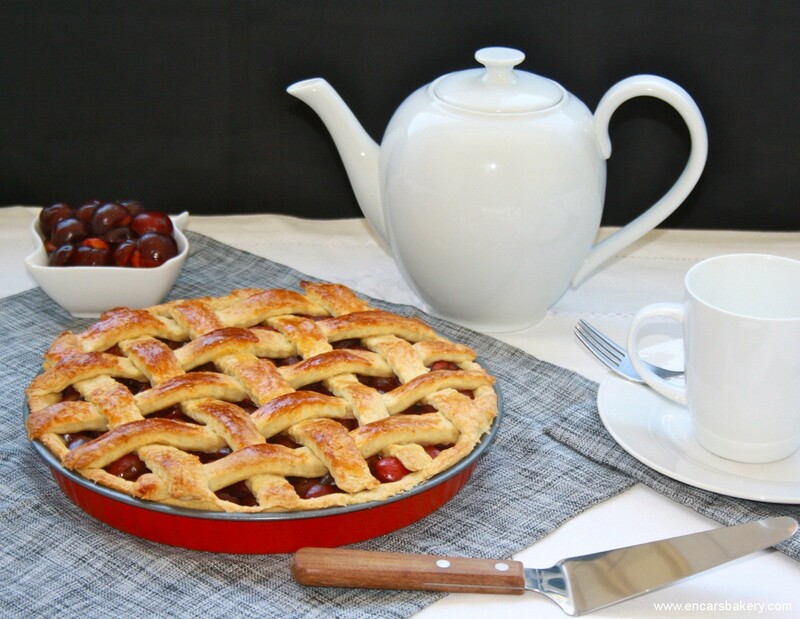 !and with this cake more, is ideal for a picnic with checkered tablecloth and wicker baskets, certainly delicious, many kisses. They have to keep making goodies with cherries, because they are splendid.. I'm glad you liked it Thanks for your comments! I describe the summer and is so wonderful, but I think in recent years, I see nothing but the negative side…the heat lol. Give me joy, party, rides, beach, Meeting with friends…but take a heat and sultry here in Barcelona. But one thing is certain the futa, how much color as it brings to greengrocers, few juicy sweet and it gives us. Today the magnificent cake… a luxury good is always coming to your blog. Encar, those summers… NSAIDs! everyone has their thing,and all are good. And this cake, that madness! have a pint of death. Just today I said at home that I have to do with a cherry pitter, Your recipe will be perfect for inauguration. I have and who to blame when it comes to the underarm jejejejeje. Mmm! Helena saw and fell in love and now I see yours I have no escape!! Aiii, Summer, and transmutes all, even humor! Impressive!! I have been on the cover of book!! I have long wanted to make, I love this kind of cakes! !